We are all excited and eager about Mumbai Monsoon arrival this year 2018 as always it is going to be lots of fun too. So i thought sharing my experience & knowledge in this one post, helping old and new people visiting and planning to enjoy Mumbai rains this year. Below is a small guide to monsoon destinations in simplest possible way intended to help you know about Mumbai Excursions and Destinations, Locations not to be missed, Best Waterfalls around, Some Visuals (Pictures and Videos), Things that makes Mumbai monsoon news global like Flooding Potholes and traffic jams, Exclusive Treks near Mumbai in Maharashtra as it is blessed, High Tide (Days, Dates and Tide heights) and ideal monsoon picnic spots for a perfect rainy day spent. Let’s enjoy and get the most out of this years monsoon in Mumbai city, Suburban and MMR..
We all know Mumbai monsoon have some or the other story every year that goes viral. Like the local train splash of 2017, Remember ? Worst was the Flooding of 2006 which Mumbai was not ready actually. These were some classic example that gave a lesson on how Humans and Nature should be balanced and how plastics clogged the Mithi river which brought city to stand still for 24 hours in 2006 flooding. Potholes story seems like a compulsory things we Mumbai citizens needs to go through every year, Hope 2018 is different and the latest declared potholes helplines 2018 be not required to call upon. But then if nothing unforeseen happens, Will that be a Mumbai any more ? If trains do not get delayed due to water logging on tracks, Specially on Central railway route, Will that be actually a Mumbai monsoon story of the year ? In any case, we Mumbaikar’s are excited and ready for all as the city always did and gave an example and spirit of ‘Show Must Go On’ and ‘Mumbai Fights Back’ every year during heavy rains. Before anything, We have to be ready with our safety weapons, I mean things like Raincoats, Umbrellas, Windcheaters etc. Mumbai monsoons are unpredictable sometimes and be any commuting options, you might get delayed and stuck. So it is highly recommended to carry some packets of chips, biscuits and similar packed food stuff and water during your travel. Our local trains never announces that the train you travelling might get stuck ahead and one needs to stay back for couple of hours, It just tries to be its best during heavy rains too. Although, year 2017 was a classic example again that showed we are humans first and religion after when Hindus, Muslims, Sikhs and others stood up together helping citizens with food and shelter at Gurudwaras, Mosques etc during that one ‘Mumbai Stand Still’ day. That’s the spirit and one of the reasons i love Mumbai and never care about heavy rains. So, get you pair of umbrellas, windcheaters, rainy shoes ready and be prepared in first week of June itself. What next, We talking about Enjoying Mumbai rains and another preparations is to know about places best to hangout with family and friends in and around city. Also, Keep note of High Tide Dates 2018, List of Famous Waterfalls, BMC Helplines and also know which are flood safe car parking locations and major flooding locations in Mumbai in past so that you can avoid getting into trouble during high tides days. This way you are prepared for this years monsoon to be safe and to enjoy the rains too. In this section i will try to help with my personal experience of last so many years in city to get the most out of monsoon days. It is also important to understand and take serious note about few things to avoid some risks in day to day life of Mumbai rainy days. Otherwise, With that glass of cutting chai, bhajiyas and sweet corns, long rides and these destinations, Monsoon is at its best in Mumbai. Let’s begin. This place rocks during monsoon and specially on tides days. People specially blocks their calendars to not miss those huge tides and splashes. I tried to capture a video of Nariman point high tide (Not the highest tide) but still you get the fun of it. Nearest railway station being Churchgate, this one destination is all season hit and monsoon brings in a special reason to visit. Check below video and learn more about this promenade. Nariman point and Marine lines are connected and on same stretch, so do not get confused of the location. People do refer as marine lines high tides for same. Below are both location monsoon videos. ALERT !!! : Seating, Standing and Walking on boundaries (Seating area) of Nariman Point & Marine Lines during high tide splash is very risky. Historic and Iconic location of Mumbai, This place is highly visited by tourists and citizens loves it the most during monsoon. To experience highest waves, sailing boats, ferry and the location itself that has the beautiful Hotel Taj right in front. Many Bollywood movies of 80’s and 90’s selected this location for few shots. Below is one Picture that shows how it feels to be at Gateway location during monsoon tides. Many more videos are available on YouTube that brings in the fun and action at this place. Nearest railway station being Churchgate in Western railway Route and CSMT in Central. ALERT !!! 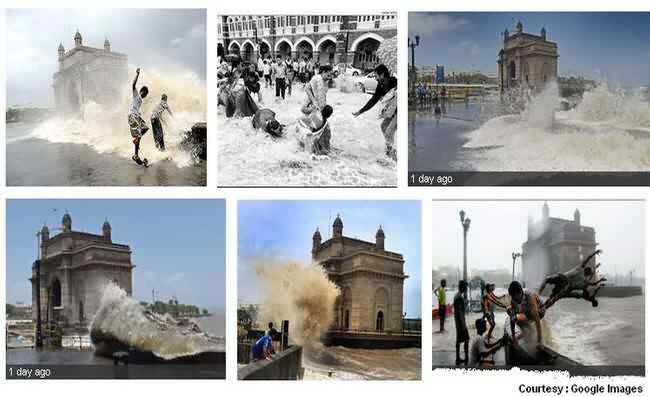 : Seating, Standing and Walking on boundries (Seating area) of Gateway of India during high tide splash is risky. This Video May Seem Little Scary, But its rare of such extreme happening, Still take care and have fun. Calm and quite otherwise, Worli sea face is one of the longest beach front that connects Bandra to Worli via the sea link. 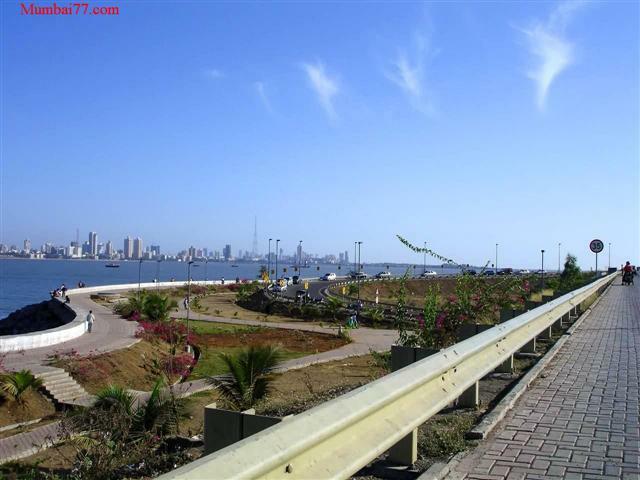 It is one of the most visited Monsoon Excursion in Mumbai for 2 main reasons now, The fun and excitement of tides itself and the pathway of Sea link which is easy to travel and fun ride in itself. Must watch this slow motion video of High tide splash enjoyed by people at Worli sea face during a perfect monsoon day last year. ALERT !!! : Seating, Standing and Walking on boundaries (Seating area) of Worli sea face during high tide splash is risky. My Monsoon Haji Ali Video got highest hits as i tried my best to give the real feel of monsoon splash by walking the pathway inside covered by sea from almost all sides. Hope you will like it too. This Holy mosque is another pride of Mumbai as it is located a Km or 2 inside sea, all covered with Arabian sea water. The fun is walking on the pathway to reach the Dargah and enjoy the scenic view of city around. ALERT !!! : The Backside area of Dargah where people enjoys the splash is risky during tides, It is not a safe zone to get in specially during tides. Mumbai is blessed with water fronts from all 3 sides and so are the rocky and sandy beaches which makes the beautiful outing locations during rainy days. Most scenic locations is Bandra bandstand area, right from jogging & walking track starting opposite Salman Khan home till the top of Fort adjacent to Hotel Taj. This fort near Taj hotel gives mesmerizing view of Worli Sealink any time you go during monsoon, Check below video to know how it feels like. In the past, bandstand was also known for the crowd that use to gather at Father Agnel Ashram and people enjoying the monsoon at the sea front which didn’t had the walkway like it is today. It is also known as best lovers point in Mumbai. If you want some privacy and hiding from rain, Head towards the private garden near the fort or simply enjoy the beach front, Lots of couples are seen getting cozy in this public area. If this is the first time you visiting Bandra reclamation promenade during monsoon, Trust me you will love it. Specially when in group or in couple. Remember the famous ‘Uday Chopra’ bike race scene of Dhoom movie ? This is that place. This is also the location for the Iconic ‘LOVE MUMBAI’ art work. The very first floating restaurant ‘Ab Celestial‘ is located here too and this can also be a good monsoon date, bit costly although. This place connect the sea link bridge to Worli and so the beautiful sea view too with changing climate. Mumbai monsoon brings in the charm and romance at this place and is one of the recommended place to visit this monsoon. This is no High tide or splash enjoying location, Yet ideal for couples in romance. Those who love nature, Borivali national park is one place not to be missed during monsoon. Specially, the early rainy days when it blossoms and the greenery is scenic and rains are still not very heavy but the excitement is high. The scenic view inside woods is what many loves. The flowing streams, flora and faunas, pollution free and the best breeze and climate is what Mumbai’s national park located at Borivali suburban offers you. Of course one needs to be little adventurous and ready to walk few miles to enjoy the rains effects at such locations. To feel the city in monsoon as a tourist or just anyone like me, One should think of getting on a bus as i do. Yes, put on your music / FM and sit relaxed in a bus to ride and hang around Mumbai city to have a great rain ride experience and possibly click around pictures if you like. Bus no’s like 202, 203 and 79 are perfect to get complete city view of western suburban in monsoon. It goes through the S V Road route and the famous locations like Lokhandwala, Link Road etc. The Above locations were all within Mumbai. Now lets understand and explore a little more details and check best monsoon excursion not far from city at about 100 to 150 Kilometres ideal as road ride. These are the destinations major visited and well known near Mumbai. An important point to remember here is try avoiding locations like Lonavala during weekends or one may end up half of the day inside traffic. Here we go. Igatpuri : Just a week back, i explored Igatpuri hills, A perfect monsoon gateway to enjoy waterfalls, ghats and more. Just 120 Km from Mumbai, Igatpuri is one place if you love nature, greenery, smog, road drives, waterfalls, fort hiking as one package in Mumbai monsoon. Lonavala : One of the most visited monsoon excursion near Mumbai. Hardly 2 hours at distance of about 85 Km. As soon the rain starts, this famous monsoon destination gets crowded. In recent years, it was seen that Saturdays and Sundays were hectic rather than fun as the traffic jam inside was so huge that authorities had to put some restrictions on entry exit timings of cars at some locations and other for heavy vehicles movement in the area. Matheran Hill Station : This place is actually a tourist destination to beat the summer heat and otherwise get a pollution free climate, Yet many make special plans to visit Matheran during rainy days as the Heritage mountains are scenic and gives very beautiful view of valley around. Resorts and other stay options are cheap comparatively during monsoon as it is a off season. Mud puddle might be the only seemed problem here as their is no concrete roads around this hill station. Malshej Ghat : A perfect 1 day excursion mountain pass location between Pune and Thane. These is a dense hilly western ghat location with lots of waterfalls on the roadway itself. Just park your car at the location you like and get inside the waterfall you like. One needs to take care of slippery stones at every waterfall and drive safe on this hilly road. Another caution is NOT to wander around OR make plans at this location during heavy rains as landslides is very common here. Checkout Malshej ghat pictures and plan your excursion in early June and July to get the maximum fun. Waterfalls : Nearest waterfalls for those who don’t want to leave city and MMR locations are Tungareshwar and Chinchoti (Vasai Highway), Both are ideal monsoon destinations and a great excursion , Hangout locations for a day. Tungareshwar is known for the famous Shiva temple deep inside jungle which needs half hour trek. Both are safe locations for family and friends, Although one needs to take care of Chinchoti during heavy rainfall and specially a corner area of Waterfall pond which has claimed live’s. Tungareshwar is rather safer compared to Chinchoti as the pathway is fun during not so heavy rains. One can find small waterfalls along the pathway and the half hour jungle walk is a very beautiful experience during rains. Read more about Tungareshwar and Chinchoti before you plan a day monsoon trip here. Kharghar and Navi Mumbai area do have some lovely waterfalls, refer the list of 16 most visited waterfalls to gain more inside about location, distance, safety and other details. Monsoon Treks 2018 : Looking out for some more adventurous things to do this monsoon ? Refer list of all these monsoon treks near Mumbai that can be explored well in group and say Cheers to life. There are more places ideal as Monsoon picnic spots not very far, But not inside city. Do your homework well and enjoy the rains of 2018. 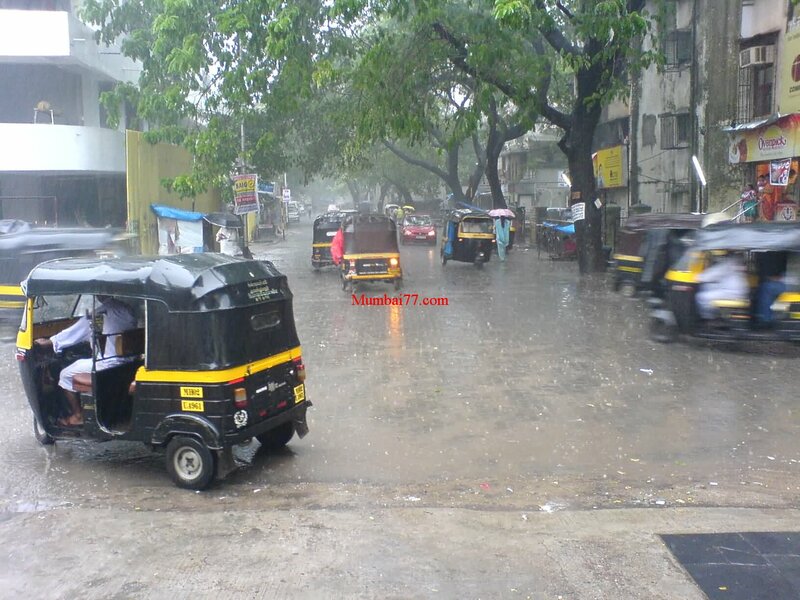 Here is a article dedicated to Mumbai monsoon videos if at all i missed it somewhere before. Hope i was able to help you. If yes, help your friends too by sharing this. Happy monsoon.